(plates for scale, it didn’t even fit in our biggest casserole dish). In fact they cooked two marrows: the monster, which was stuffed with practically everything from the store cupboard plus some cheese, and its baby sister, which was created as a vegan version, with same miscellaneous filling but no cheese. These fed several hungry musicians, plus a few of us oldies for tea one night and the leftovers were turned into a rather good soup which fed us all the next day too. This was inspired, we think, by The Trouble with Grandad by Babette Cole, a much loved favourite from when the musicians were much smaller. 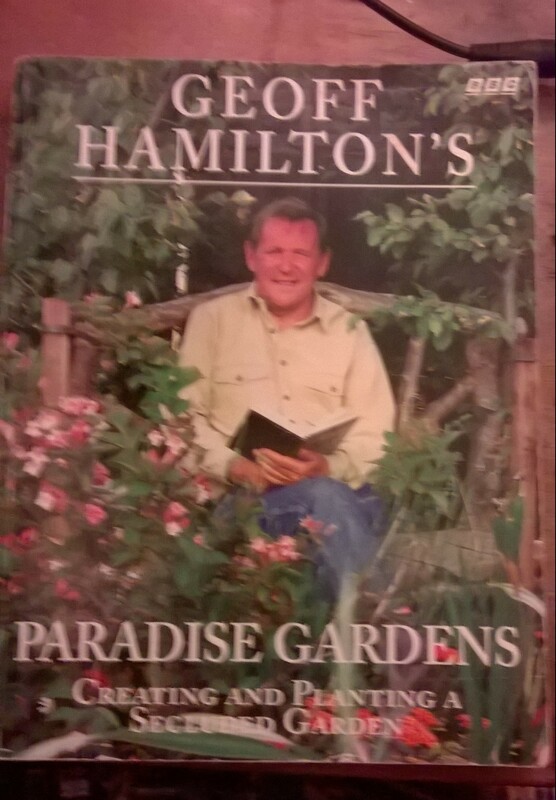 Fortunately we still have a copy so were able to remind ourselves of this glorious gardening story. I won’t give a way any plot spoilers, but lets just say that it features a similar giant vegetable which is not dissimilar to our bus marrow. Wonderful. But these are best just eaten raw in salads, or even straight from the plant as a mid-morning snack. The plum tree is weighed down with fruit this year. My mother gave me this when I first left home as a student and it has followed me around since. Usually I follow the ‘make it up as you go along’ approach to cooking and don’t rely on recipes at all but this book contains several important family recipes: The Christmas Pudding*, the Christmas Cake and the endlessly useful Plum and apple cake recipes . In this little book I can also find Green Tomato Marmalade, Plum (or rhubarb) flapjack , lavender biscuits, rosemary Christmas trees. If I can’t find a recipe in there, I can usually find what I need in one of the cookery books on the shelf. The observant and numerate among you will have noticed that the above recipe only uses 2 kilos of plums – that’s because they wouldn’t all fit in my big pan. So I have one kilo left, and today I’m going to try and work out how to make them into plum pickle – several reliable books have been ransacked for relevant recipes and I am in the process of adapting them for the ingredients I actually have – watch this space once I’ve worked out how to do it. *You’ll notice that I haven’t given you the recipe for the Christmas Pudding. It is an ancient and secret recipe which has been passed down from mother to daughter over several generations – I will pass it on to my sons in due course. We bought this plant when the boys were very small. It was a wet day, things were getting a little fractious indoors but I had spotted an advert for a plant sale at the local church hall. These were the ‘Doing the garden‘ years, when we resembled the family in Sarah Garland’s lovely book. There was a bit of a battle going on. I was running out of vegetable space but the boys wanted more flowers. ‘Let’s see if they have any bargains and we’ll try and find a space for them?’, I’d said, hoping to pick up some extra courgette plants. When we got to the hall, it turned out to be a rather posh affair: not bargain plants at all but quite expensive individual varieties of flowers. No vegetables. We came home with this little purple plant. We found a home for it and it has flourished, coming up every year and lovingly moved with us to our new home. I think it’s a kind of geranium but perhaps another plant expert can keep me right here. The yellow flower in the photo is Craws’ Taes, otherwise known as Birds’ Foot Trefoil. It reminds me of my own childhood and summers in the far north of Scotland. I loved it then for the contrast between its local name and its posh official name. I love it now for its bee-attracting properties. 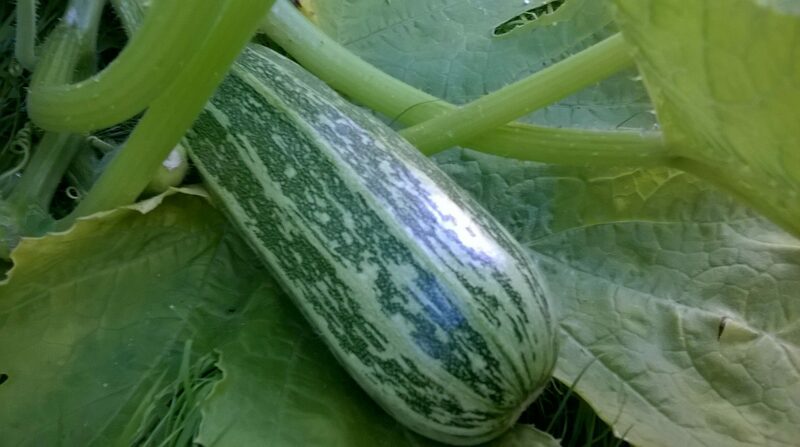 What is it with marrows? People seem to love them or hate them. I have one gardening/cookery book which takes hatred of the beautiful beasts to extremes ‘I have never seen a marrow in a top restaurant’ (good reason not to go to one then) and ‘I challenge any reader to send me a marrow recipe devised by a top chef’ (good reason not to bother with top chefs then). I persevere with this particular book because it has other useful recipes. But how could anyone hate these beauties? 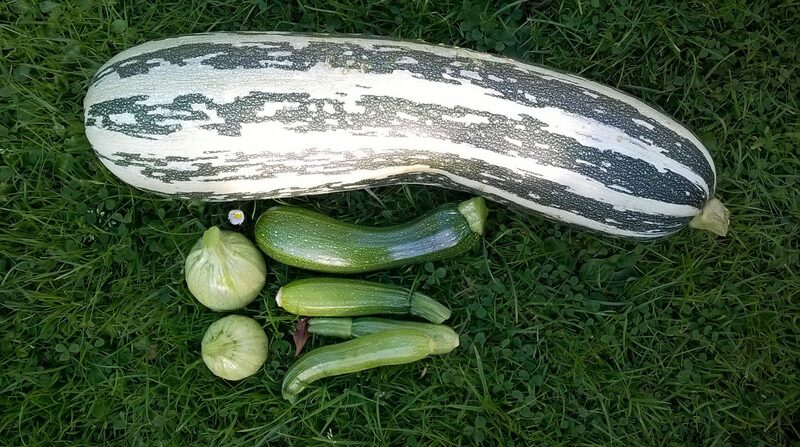 Here pictured with some of its smaller, cuter, but less awesome, cousins, the courgettes. You can see which side of the love/hate divide I fall on. I love marrows because they are extreme – they grow almost before your eyes, and keep on growing, even in a coldish, wettish, northish facing garden in Edinburgh – if you can get them past the seedling stage they seem to be immune to slugs (that’s because the slugs have read about the top chef thing and avoid them) – and you can make completely mad recipes with them. Pour into warmed jars and seal. It was a bit of a faff – all this leaving overnight and repeating – but I followed it more or less diligently. I think it worked – the scrapings from the pan certainly tasted good. but the marrow more or less disintegrated, turning the whole thing into jam and not really mock anything. I think the boiling for an hour bit was extreme. I asked an assistant for an opinion ‘It tastes of marrow.. and ginger .. and sugar’. Hmm. We’ll try it as jam but next time I might just follow the rather more straightforward (bung it all in a pan and cook it) marrow jam recipe instead. In the meantime, the next best thing to do with marrow is to make marrow chutney – see here for a recipe. I’ll keep growing marrows no matter what the top chefs say and, when we open up the jars and try the jam/mock ginger, I’ll think of of our dear friends. I don’t really do Latin names for the plants in my garden – I prefer to think of them in terms of how I can cook them, what they smell like, where to grow them, when they flower or why I’ve got them. But sometimes Latin is helpful to help you identify something. So, that’s the Latin over with. What about the other aspects of this plant? Cooking: – I don’t think so – I didn’t realise this but, according to the RHS ,they are poisonous so just as well I’ve never thought of trying. When they flower: now! Well midish spring I suppose which is why they are in my dark corner which I devote to late winter/ spring flowering things to cheer me up. Where they came from: for me that’s the interesting thing about this weird little plant. We first acquired the mice from a retired botanist who took a liking to my small children. Touched by my older son’s passion for flowers when he was five or six, this elderly lady often brought us gifts of plants that she thought the boys would like. So she gave us a piece of mouse plant. ‘Plant it and look after it and let me know when you find the mice’. So we planted it beside our shed in our old garden. We had spotted live mice under the shed so it felt like an appropriate place. It seemed a rather insignificant little plant but it produced mice and we were delighted. When we moved to our current house, we had to bring the mice with us. I dug them up, divided them and left some for the new owners (and the mice). They were among the first plants to find a home in our new garden – an optimistic hope that we could recreate some of what we had left behind in our much loved old garden. Now they are very settled and very prolific and the mice reappear every year: quiet, hidden and lasting only a few weeks but they remind me of happy times and a kind retired botanist who took an interest in small children. Sadly she is no longer with us but our memories of her live on. One of my favourite gardening books is ‘A Gentle Plea for Chaos’ by Mirabel Osler (Bloomsbury 1989), a lovely book with a true gardener’s understanding of what it means to live with a garden. She reminds us of the importance of relating plants to people. Many of my flowering plants have come from relatives or friends: as gifts, as cuttings, as purchases with birthday garden tokens, or recommendations. Some date back to those days with small children, when we spent a lot of time in garden centres and plant sales and came home with the most surprising things. (We were a bit like the family in Sarah Garland’s ‘Doing the Garden‘) . I try and remember where these plants came from. I don’t always succeed but the mouse plant is special. Today my seed order came through the post: Peas, courgettes, tomatoes, runner beans, marrows, sweet peas – all so exciting. I’ve also got quite a lot left over from last year. And a recent birthday brought a garden token and some perennial flower seeds. I was going to look these up on google but decided to use my trusty bookshelf instead with the flower bible Royal Horticultural Society Encyclopedia of Plants and Flowers – my copy (another birthday present) dates from 1994 and its been updated since then but it still found me information about these exciting seeds. Now all I need is a little time to get my seed sowing under way and work out where they are all going to go. New Year, time to do a bit of tidying up. I did a little in the garden this morning, clearing away some more dead vegetation and putting nets across the raised beds to keep the cat off. But then it got dark and I moved inside and tried to clear up my desk a bit. It was hidden under a pile of books and papers so I’ve had a satisfying clear out. Actually, it’s still pretty hidden but at least I now have a rough idea of what’s there and why. This also involved putting at least some of the books back on their correct shelves. Which is when I realised that my garden books had overflowed their allocated bookshelf space – time to pass some on to a charity shop? I don’t really need any of them but I like them all for different reasons. I’ve written about some of my favourites before: indoor gardening, containers, cookery books, children’s books but here are my absolute top gardening books. 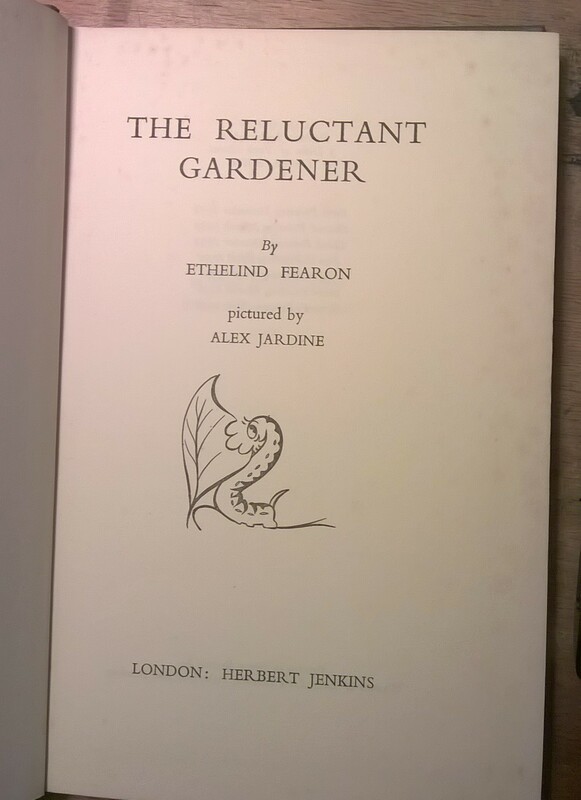 Number one, my all time favourite gardening book is The Reluctant Gardener, by Ethelind Fearon, published 1952. 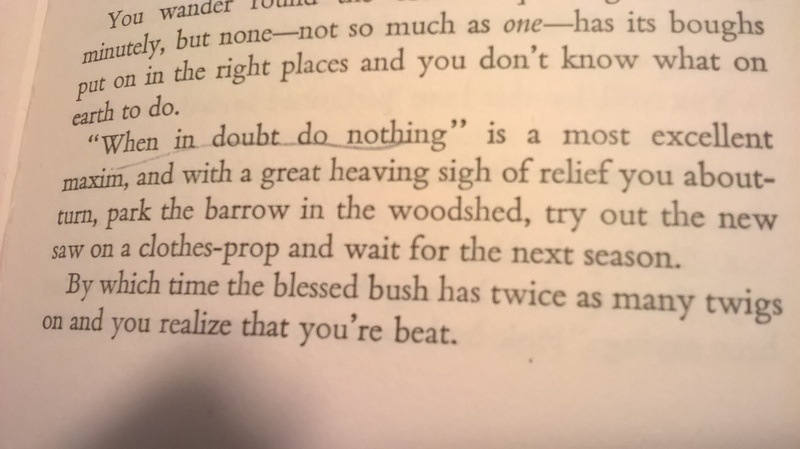 The book pretends to be a lazy person’s guide to gardening but it uses this excuse to show that ‘doing nothing’ can often be the best way. ‘What we want is a garden which will do its own work, feed itself, clothe itself, sow itself, grow itself, tie itself up, cut itself down and in all respects be as relaxed and happy as its owner’. She continues her advice on pruning shrubs to say that the best way to do it is to ‘cut off the bit which has bloomed’ ‘while it is blooming’ and to prune the blackcurrants by cutting off whole branches of fruit and bringing them indoors where it is easier to detach the currants. She also has useful advice on pest control and compost making. 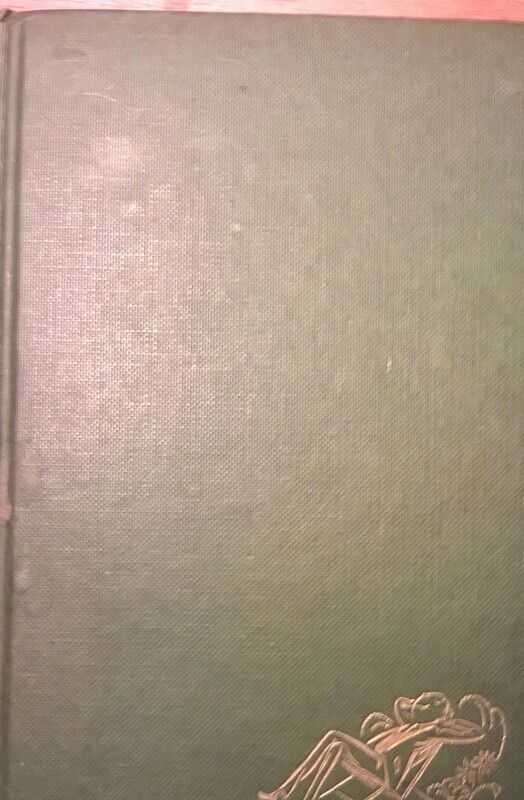 Of course a book published in 1952 is rather old-fashioned and has its dodgy moments but it has been an old friend to me. This tells me everything I need to know about sowing, pruning, harvesting, soil, compost and dealing with pests (except that it doesn’t tell me everything about pests, as I’ve yet to find a solution to either slugs or vine weevil that actually works). It has the added bonus for me that I bought it with a book token that I received for a piece of illustration work so in a sense I earned it. 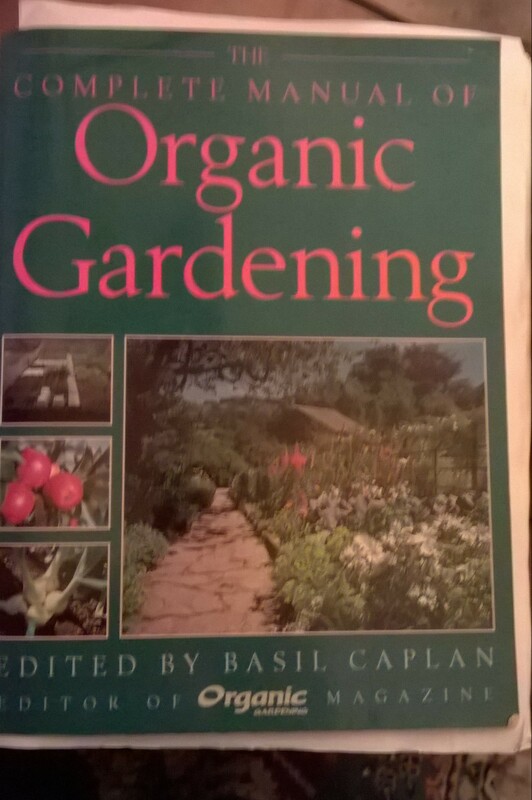 My bookshelf contains other gardening gems that I turn to from time to time. I don’t think I can spare any just now so it will just have to overflow.